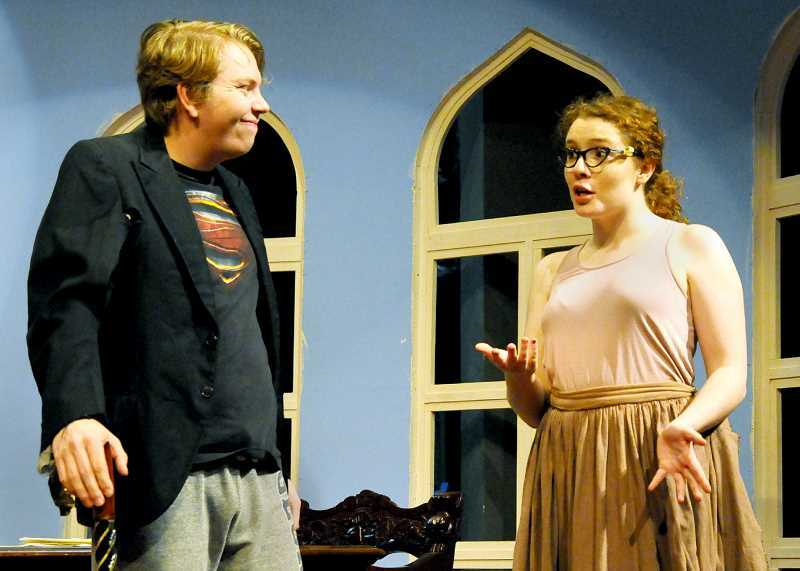 A comedic portrayal of government corruption will be on display at George Fox University starting this week as the school puts on a performance of the Russian play "The Government Inspector." The satirical play, directed by theater professor Rhett Luedtke, was originally published in 1836 and tells the story of corrupt officials in a small Russian town. It is a comedy of errors when the corrupt mayor learns a government inspector is coming to town. The play premiers Thursday and continues through Saturday, beginning at 7:30 p.m. in Wood-Mar Auditorium. The play resumes Oct. 25-28, with all shows beginning at 7:30 p.m. except for a 2 p.m. matinee on Oct. 28. Luedtke said the theater department was looking for a classic "high comedy with larger than life characters" for its fall production. "The Government Inspector" checked all those boxes. He was drawn to it because it's also a story about government corruption, not just applicable to small Russian villages but also with a national and international application. "What do you do when those in power keep the power and do that for their own good rather than the good of the average citizen?" Luedtke said. He added the play has funny things to say about the current political climate, while also serving as a reminder that political unrest was happening centuries ago as well. "What is it about humanity in general and about the human condition that creates corruption as it's tied to power and prestige and wealth?" he said. Luedtke said while it's easy to be cynical with what's happening in the political world now, it's important to remember it's been a historical problem. The play features more than a dozen students to fill the roles, and is described as a story of mistaken identity, human greed and political corruption. Luedtke said the 13-member cast is about the average size for a GFU production. He added that students have a positive impression of the play, jumping right in and have been excited about the message of the play. He added they've perhaps been humbled by the message, learning that political turmoil is not something new to their generation. "It's also just hilarious, it's been fun to show up to rehearsal every night with these characters," he said, adding the play is an opportunity for the community to come "laugh at our folly, that corruption doesn't get the last laugh, that it's ultimately exposed for what it is." Luedtke said while he would give the play a PG rating, he did say there were things in the play that children under the age of 10 might not understand. For example, while he said it may seem celebratory at times, the play is largely a cautionary tale. "Just come laugh with us," he said. Tickets are $12 for general admission, $8 for seniors and alumni, and $6 for students and children ages 12 and under. Tickets are available online at theater.georgefox.edu or at the box office in the campus store Monday through Friday from 10 a.m. to 2 p.m. Tickets will also be available at the box office in the lobby an hour before the shows begin. The George Fox University Jazz Jam will return to the Coffee Cottage in Newberg for a concert on Oct. 26. The student ensemble, led by professor Nathanael Ankeny, will play from 7 p.m. to 8:30 p.m. The Chehalem Cultural Center will kick off a new exhibit from the Columbia Fiber Arts Guild on Nov. 6. The exhibit, titled "Heatwave," is a themed exhibit of art quilts from the High Fiber Diet of Columbia Fiber Arts. It runs until Jan. 5. The Chehalem Cultural Center is hosting a night of Cuban music Oct. 19 with the band Son de Cuba. The concert, which is in the grand ballroom and runs from 7 p.m. to 8:30 p.m., is part of the CCC Concert series. Doors open at 6:30 p.m. Son de Cuba has roots in the Latin, African and Jazz rhythms, blended together with beats from modern and classic Latin songs. Tickets are $10 for adults and the show is free for anyone under 18 and $5 Arts for All tickets will be available at the door. Tickets are available online at https://www.brownpapertickets.com/event/3602234. The Chehalem Cultural Center will host a community memorial in Butler Square on Oct. 31 for la Dia de Muertos, commonly known as the Day of the Dead. The memorial event, which runs from 5 p.m. to 8 p.m., is celebrated in central and southern Mexico at the beginning of November. The community is invited to add items to the actual memorial built to celebrate the lives of family members who have passed away. The Newberg Community Band will host a concert to honor veterans Nov. 11 at George Fox University. The concert will feature patriotic music and lively dance tunes, as well as the first public performance of Brent Weaver's "Chehalem Overture," which was commissioned by the band. The concert starts at 2:30 p.m. in Bauman Auditorium. For more information, visit www.newbergcommunityband.com.